This, however, is just a partial victory as the right to food and sovereignty from unfair trade rules remain in peril. The stalemates have also been caused by the rich countries pushing for issues that would be beneficial to them such as trade facilitation, investment, government procurement and competition, while ignoring long-standing demands of developing and least developed countries. These demands were promised to them as part of the Doha Development Round launched in 2001, such as numerous promises of bringing development to the developing and Least Developed Countries (LDCs), eliminating trade-distorting subsidies of the developed countries, and ending dumping or the practice of flooding markets with goods below their cost of production. The elimination of export subsidies, for example, promised in 2005, passed the 2013 deadline and was only finally fulfilled in 2015. But without meaningful reforms in the US and EU domestic subsidies, these had the same effect as export subsidies, flooding developing markets and undercutting small farmers. Studies show that heavily subsidized EU milk powder enters the market of Burkina Faso at only 34 cents, whereas the the local cost of production of milk powder by local farmers is 91 euro cents per litre. This disparity in price is an emblematic example of the inequities built into the WTO Agreement on Agriculture (AoA). Still on agriculture, the contentious “peace clause” that was the centre of controversy in Buenos Aires, was also about the refusal of countries such as the US to give something as vital as the ability to let developing countries have public food stocks and subsidies for their subsistence farmers to guarantee their national food security. This hypocrisy of the rich countries being able to continue through various loopholes in the AoA to provide trade distorting trade subsidies to their agribusiness but blocking the poorer countries the right to guarantee food security and provide their constituents the right to food, a universal human right. In simple terms, the “peace clause” was given as a concession to countries of the Global South to appease their original demand for an amendment to the AoA so that they could provide domestic support to small and subsistence farmers, without breaching the limits set in the AoA. This demand of the developing countries was made in the spirit of guaranteeing food security to their people and for public stockholding purposes. But instead of giving this amendment, the rich countries gave a temporary “peace clause”, meaning that poor countries could provide that domestic support and breach the AoA limits and not be sued under the WTO Dispute Settlement Mechanism for violating the rules of the WTO AoA. This “peace clause” was promised to be replaced with a permanent solution that would allow them to have stockholding and that the deadline was the 11th Ministerial in Buenos Aires. This “peace clause” agreed to in Bali came at a high cost to developing countries as they in turn had to agree to the comprehensive Trade Facilitation agreement, an issue that had long been on the wish list of transnational corporations (TNCs) and developed countries. This agreement was a great victory for the newly elected Director General Roberto Azevedo, as this was the first ever agreement of the WTO since it was established in 1995. Despite the high stakes paid for a measly “peace clause”, there were still hurdles and further concessions being demanded in order to end the “peace clause” and give a permanent solution. In truth, developing countries had already “paid” for the permanent solution by agreeing to the Trade Facilitation Agreement in Bali. However, in Buenos Aires, they were being asked to pay yet again, by agreeing to even more demands from developed countries. But even that was not enough for the US, as it walked away from the negotiations, leaving developing countries once again empty handed and left with no permanent solution. The inequities of the WTO Agreement on Agriculture is just a sample of the rest of the inequalities of the rules of the WTO. The WTO was never and will never be about providing a level playing field nor improving the welfare of the poor by delivering so-called development. The WTO is about providing undue advantage to the big and powerful, or in a simple visual to imagine, the WTO rules favor the sharks over the sardines. The most worrisome part of the draft texts in Buenos Aires was the lack of reference to the so-called Doha Development Agenda. The specific impact of politically killing off the Doha round is that all the “development” aspects of that round and all the demands that countries of the Global South had included there will be lost. 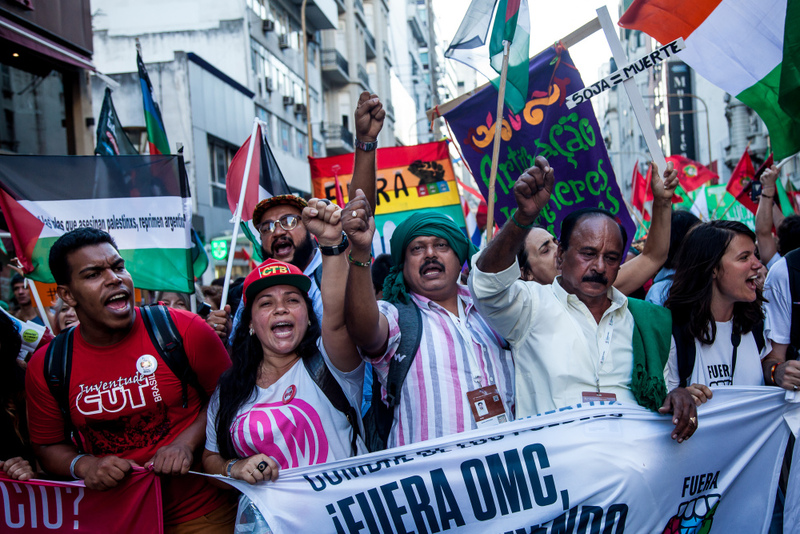 The Doha round had a single undertaking principle – nothing is agreed until everything is agreed – and this had been a way of holding back the extreme liberalization plans of rich countries and TNCs. *Mary Louise Malig is a trade analyst and campaigner from the Philippines and now currently based in Bolivia. She has written on the issues of trade particularly the World Trade Organization (WTO), climate change, agriculture and the green economy. She is co-author of the book, The Anti-Development State: The Political Economy of Permanent Crisis in the Philippines and author of a number of other papers and publications. Malig is currently Campaigns Coordinator of the Global Forest Coalition.